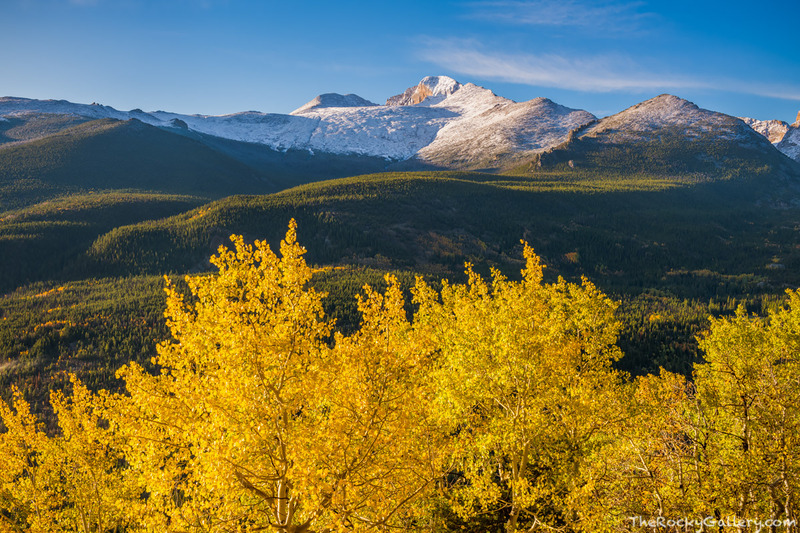 Autumn in Rocky Mountain National Park is just flat out amazing. There are no words to describe hiking through a hillside of golden aspens trees or wathcing the sun warm a mountainside covered with fresh snow from the night before. The aspens were at their peak splendor this September morning in RMNP when I photographed this scene. 14,259 ft. Longs Peak was covered with fresh snow as these golden aspens frame a nearly perfect bluebird morning in Rocky Mountain National Park. Photo © copyright by Thomas Mangan.